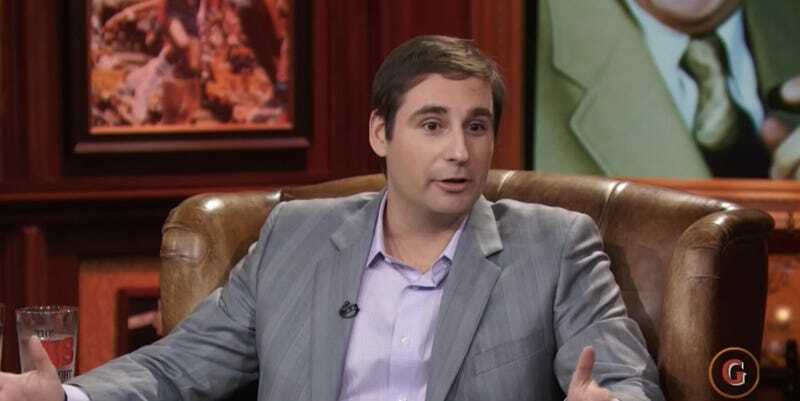 ESPN has re-signed superstar basketball reporter Zach Lowe to a multi-year contract, according to multiple industry sources. Lowe joined Grantland from Sports Illustrated in October 2012 and spent three years there before transitioning to ESPN.com, after ESPN pulled the plug on Grantland. His contract was up this fall. ESPN wasn’t the only suitor for Lowe, who Slate’s Josh Levin called “America’s best sports writer” earlier this year. Since at least the NBA Finals, the big rumor within basketball media circles was that Lowe would follow former Grantland coworker Jonathan Abrams to Bleacher Report—one source confirmed Bleacher Report’s offer as “aggressive.” Numerous people told me they’d heard Bleacher Report offered Lowe one million dollars annually, though they were almost as quick to add that that seemed ridiculous. For comparison, the New York Post reported that Yahoo is paying Adrian Wojnarowski $8 million over four years to run The Vertical, though an informed source told me the deal was closer to $6 million for four years, plus stock options. Hanging onto Lowe means ESPN has won its second big battle to retain top-tier basketball writers. Earlier this year ESPN re-signed Ramona Shelburne, after Wojnarowski made a strong offer for her to join The Vertical and strengthen his army of scoopers. There has been occasional resentment behind the scenes about Lowe’s role, however. It didn’t help that he joined from the site created by Bill Simmons—whose beefs with ESPN proper are numerous and don’t need to be recounted here—and multiple ESPNers told me there was some chafing that Lowe got to work with his old Grantland editor, and was perceived of as not having to work within the same structures as everybody else. But those problems are small enough that they should’ve been easy enough to solve during contract negotiations. ESPN has been cutting costs and a lot of high-profile talent has left recently, but ultimately, Lowe is one of those rare reporters who are worth their large paychecks. Lowe didn’t return a phone call requesting comment, and ESPN declined to comment.